The kids are bored. Of course they are. We started a 20-day-no-screen-time-challenge weeks ago, more about that soon. The 20-days have long passed since that first day. It went so well that we extended the 20-days with another 20 days. And to be honest, they are not bored at all. Since we started the challenge they hardly have been bored. Their creativity is flowing. Except for the first few days. But I wanted to start somewhere. The first couple of days were a drag. But after that, it was actually really nice. No nagging children. They started to play. They were enacting scenes from movies. Again no screen time. It IS hard. Not on them. On us. How easy is it to turn on the television and have some quiet time when I am preparing a meal. Now, I have to think of something else to keep them busy when they are all done playing. So here is a list of 13 things I have made them with things I had lying around and never thought of. Sometimes when we order items they are wrapped in bubble wrap. It is a fun way of painting. 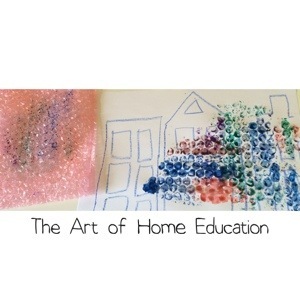 First we draw something on the paper and then we paint the bubble wrap and use it as a stamp. This time we used a different item to paint with. Instead of brushes we choose paper rolls and were really excited how it would turn out. The paper rolls can be manipulated in different shapes. You can leave them round, but you can make them square shaped, triangle shaped, star shaped. It is fun to see what the kids come up with. A fun activity to do. 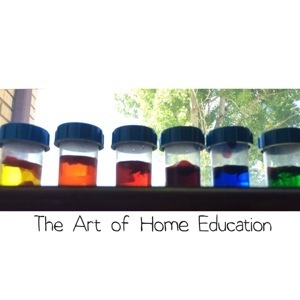 For this activity we added water with some food coloring in a form and left it overnight in the freezer. Now the kids can paint with colored ice on a stick. 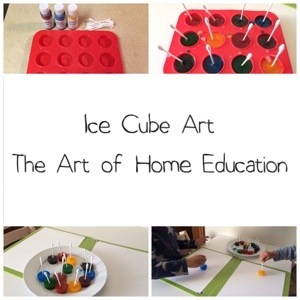 You can also choose to do this activity without the stick in the ice. The boys here thought it was funny, their hands stayed clean and they were happy with the icicles too. 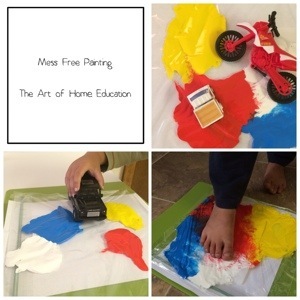 This is a great activity, when you as the caregiver don’t want the paint to go everywhere. 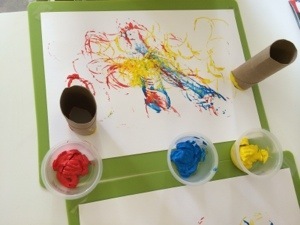 The best paint for this activity is finger paint. 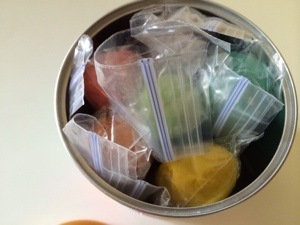 Add the paint to a ziplock bag. For painting tools we used cars. We did this activity earlier, we made footprints that time, and had so much fun that we repeated it. The children love to do experiments. This experiment is to see how water travels through the paper towels. By adding food coloring you are able to see the water moving. You also see that the colors mix and what colors are created when colors are mixed together. We don’t drink milk, due to allergies. But sometimes they are lucky and someone leaves milk at our house. We don’t like throwing things away. For this experiment we fill six apple sauce cups which we repurpose with a little bit of milk. We have three colors food coloring available: red, yellow and blue. We add a drop of yellow to one cup and see what happens, we add a drop of red and observe again and the same for blue. Then we add yellow and blue, yellow and red and red and blue. The boys like the fact that they can see how the colors turn to other colors. A fun way to talk about primary and secondary colors. This is a fun way to dye paper. We add a little bit of milk to a baking pan that is big enough to hold a a4 size paper sheet too. The boys add drops of food coloring and swirl it around with a q-tip. they lay the paper on top of the milk, take it out and leave it to dry. They color as many sheets of paper as they want. We use these papers when they want to write letters to friends. A favorite to one of my boys. So when we end up with milk in our house the boys are thrilled, because they know they can do this experiment. I fill a baking pan with milk and the boys at food coloring. Then they start with a q-tip that has been soaked in dish soap. They swirl and make the most fun movements. It is like magic. Another activity where the boys are practicing their primary and secondary colors by mixing red, yellow and blue food colorings. Currently we use baby jars to hold the colored water. In baby jars they add water and a drop, or two drops of food coloring. Afterwards they label the jar with the name of the color. 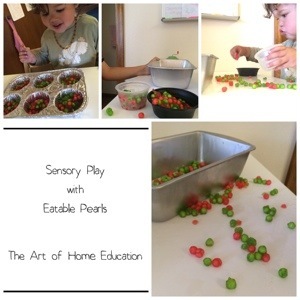 Playing with tapioca pearls or water beads. The boys love to sort them by color or play with them together with their mini figurines. I prefer the water beads from the tapioca pearls, because the pearls become very sticky, or I didn’t do it right. The boys don’t have a preference at all. I made moonsand (or moon dough) from 8 cups of flour and 1 cup of baby oil. It smells nice and it can stick together but it falls apart as easily as well. I made this batch three years ago and it is still good to play with. 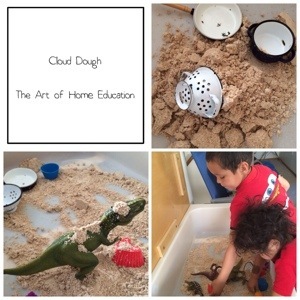 I also made cloud dough, which you can find here. Once in a while I make play dough, which is always nice to have around. It is easy to make and the boys love to play with it. The version I make is gluten free and smells really nice. You can find the recipe here. My boys love to collect stones. When we walk outside they always have to bring them with them. Same goes for sticks and feathers for that matter. So we started to make stone art as an activity. Sharpies, stones and creativity equals art! What are your Kids doing when You are Cooking? Well this is it for now. Thank you for reading. I am curious what your kiddos are doing while you are cooking! Let me know. This post contains affiliated links. Clicking on those will cost you nothing extra but helps me to earn a little bit of money to pay for this website.